B — Black gradation with the D colour. D — Pure colour, no added black or white. H — White gradation with the D colour. Sticks are rich and buttery in texture. The pigments slide right off the stick without crumbling or breaking. 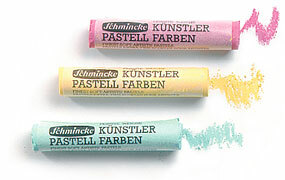 Schmincke Pastels are prepared by hand and by traditional machines. Also labelled by hand to prevent breakage. Schmincke's generous size full stick measures 2-5/8" long × 7/16" in diameter (67 mm × 11 mm).